Recently, the price of bitcoin has reached a record high—increasing by more than 500% since early this year. Due to its decentralized nature and the popularity of block chain technology, there are those who see a bright future for cryptocurrency. Furthermore, the performance of bitcoin investments has attracted the attention of traditional investors looking to hop on the bandwagon through investments in companies likely to be impacted by this new technology. Imagine’s constantly-expanding data offering allows investors to access historical prices of the bitcoin cryptocurrency (using the symbol USDBTC). With this data, investors track the relationship between holdings and bitcoin using a historical price time series of a portfolio containing holdings with cryptocurrency exposure. 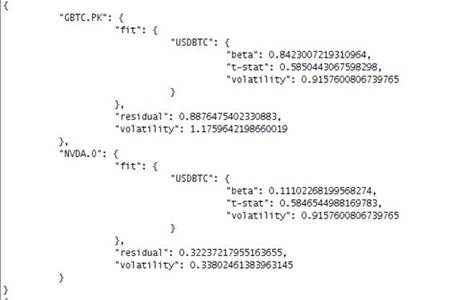 They then create a custom calculation (custom column) to calculate beta between the daily, weekly, and monthly price of each holding, and that of USDBTC within a certain time frame, e.g., 90/180/365 days. 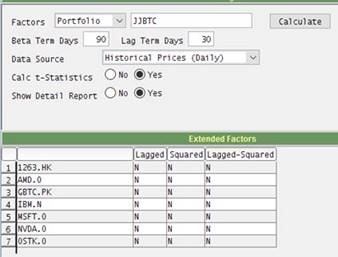 The customized beta calculation can be displayed as a standalone portfolio column, or incorporated into more advanced custom calculation columns, as shown below. Investors looking to analyze the correlation between bitcoin and companies influenced by cryptocurrency utilize Imagine’s regression tools, either from the Imagine Trading System (ITS) or via the Imagine Financial Platform (IFP). ITS users use a Multi-factor Regression tool that runs a least-squares regression on the portfolio to solve the beta relative to the chosen factor of USDBTC. The generated beta details can then be utilized by Imagine’s other risk tools, like a random Monte Carlo simulation. Imagine 8.1 introduces the ability for an investor to run the multi-factor regression via an IFP app. Similar to the tools available within ITS, an IFP app offers the flexibility to define inputs like data source frequency, independent factors, time frame, and securities to be analyzed. The output gives the result based on the desired setup. Jie Shen recently joined Imagine with more than three years’ experience in consulting and workflow customization in the financial technology industry. Jie is a member of Imagine’s APAC consulting team and will engage in new client implementation projects. She holds a PhD in Financial Mathematics from The City University of Hong Kong. She can be reached by email and phone: +852 3929 2268.